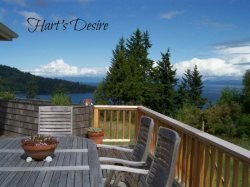 Perfect studio apartment just steps from a high bluff with stunning water views of the Strait of Juan de Fuca, Dungeness Spit and Mount Baker. This little gem is a wonderful getaway retreat for a couple needing to relax and spend a little quality time together. The studio does share the property with the homeowner's main house, but has it's own private entrance. The cozy studio is set up like an executive suite with comfy king size bed (two twins together), kitchenette, dinette seating and swivel recliner for enjoying a little reading or watching a movie. There are some lovely pictorial reference books available for you to enjoy about native birds and marine mammals in our area. The kitchenette is equipped with a microwave, toaster oven, Keurig coffeemaker, mini fridge and sink. Great for preparing small continental breakfasts for two and snacks, while leaving room to enjoy romantic dinners for two at Dockside Grill on John Wayne Marina or Alderwood Bistro. The nearby Dungeness Spit Recreational area boasts several hiking trails including a 6 mile stretch of beach out to the historic Dungeness Lighthouse. Enjoy a leisurely bike ride through the picturesque Dungeness Valley or take a ride from the Dungeness River Audubon Center at Railroad Bridge Park on the Olympic Discovery Trail. For golf lovers, the award winning Cedars at Dungeness is just 5 minutes away. Not only is this the perfect place to get in a round of golf but offers two superb restaurants, Stymie's and the Double Eagle. Sequim's Dungeness Valley is also home to several Lavender Farms, Nash's Farm and Farm Store, the Olympic Game Farm and many beautiful beaches. Enjoy kayaking, riding bikes, hiking and beachcombing. Further adventures into the Olympic National Park are within 1-2 hours away. Downtown Sequim has several coffeehouses, antique shops, unique gift stores and local restaurants. There's even a local Saturday Farmer's Market from May to October that showcases many local artisan crafts. Homeowners respect your privacy during your stay. Homeowner does have a small dog on the property as well as horses. Please do not feed the horses or enter the stable.